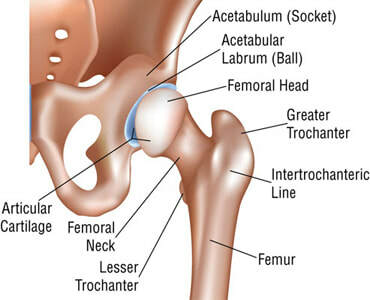 The ball of the femoral head connects to the socket of the acetabulum to form the hip joint, also referred to as the acetabularfemoral joint. This joint is the body’s largest and most stable tri-axial joint. The iliofemoral, pubofemoral, and ischiofemoral ligaments reinforce the articular cartilage and the synovial membrane provides fluid to lubricate this cartilage to allow for movements of flexion, extension, abduction, adduction, internal rotation and external rotation. Osteoarthritis, Rheumatoid arthritis, post-traumatic arthritis and arthritis from childhood hip disease can all lead to damage of the articular cartilage. Articular cartilage is the spongy substance on the end of each bone that allows for shock absorption and lubrication. As this cartilage wears away this leads to osteoarthritis. Dislocation or fracture of the hip may lead to avascular necrosis and subsequent arthritis of the hip. Avascular necrosis is bone death as a result of limited blood supply to the femoral head. Hip replacement is the common result of avascular necrosis of the hip. ​Common symptoms include: persistent pain that limits sleep and activities that you enjoy as well as difficulty standing from a seated position, bending, walking, or moving the involved leg. Often when arthritis is culprit of pain it is worse when first rising or moving and improves as the movement continues. ​An Orthopaedic surgeon will conduct a physical examination and gather pertinent medical history. An x-ray image identifies damage or deformity to the hip and an MRI scan can determine bone and soft tissue condition. The surgeon will determine the severity of the arthritis and if a Total Hip Replacement is indicated. ​Physical therapy is often recommended for strengthening and mobility exercises as well as training with assistive devices such as crutches, walker, or a cane. Physical therapy for osteoarthritis of the hip can serve two purposes. The first would be to restore strength, mobility, and function of the hip to avoid surgery. The second purpose would be a pre surgery exercise program that would make the rehab after the surgery easier and more successful. The doctor may also prescribe various medications and suggest a weight loss program if applicable. ​Total hip arthroplasty is performed when pain or symptoms do not improve and function continues to decline. The Orthopaedic surgeon removes damaged cartilage or bone and then positions a ceramic, plastic, or metal implant using a pre-fit or cementing-in -place technique. This procedure normally takes a few hours and a few days of hospitalization. Physical Therapy provides early recovery assistance with motion, strengthening, transfers, ambulation, education on safety, balance and fall prevention. Depending on the surgical approach used, the surgeon may restrict certain motions for up to six weeks. The anterior approach to hip replacement does not routinely require any precautions to hip motions. Physical therapy after surgery is aimed at weaning off of the assistive device for gait, strengthening, and return to normal function. The speed with which people can be progressed off of the assistive device may be determined by the surgical approach. Patients typically do not require much PT after the surgery because of minimal pain and loss of function. ​Hip bursitis, or trochanteric bursitis, as it is more commonly known, is caused by inflammation to the bursa. A bursa is a fluid filled sac that is located between bones and soft tissue, such as tendons, to decrease friction. The trochanteric bursa is located in the lateral hip, separating the greater trochanter of the femur and the gluteal tendons of the hip. ​This type of bursitis, which tends to effect woman and middle age to elderly people the most, is commonly brought on by numerous reasons. A fall or other trauma to the affected area, poor posture, rheumatoid arthritis, previous surgery to the area and bone spurs are all common causes. While most young people affected are generally due to overuse or tight structures due to lack of stretching before activities such as biking, running, stair climbing, or standing for long periods of time. ​Common symptoms of trochanteric bursitis include pain and/or tenderness to the lateral hip, especially with repetitive movement or lying on the side in question. Pain will generally increase when pressure is applied to the area or when participating in sporting activities or even ambulating stairs. It should be noted that symptoms of trochanteric bursitis also mirror those of referred low back pain and should always be diagnosed by a doctor or physical therapist. ​In general it is not necessary to have an extensive array of diagnostic tests to determine if someone is suffering from trochanteric bursitis. First the low back needs to be ruled out because it is a common source of back pain. Once it is determined to not be the low back, the hip can be treated with strengthening, stretching, and modalities to decrease pain and inflammation. ​Proper treatment for this condition generally includes the RICE method (rest, ice, compression, and elevation) associated with a stretching program that can be supplied to you by your local physical therapist. Some physicians will prescribe an anti-inflammatory, try cortisone injections, or aspirate the bursa to help decrease inflammation. These are all conservative approaches and generally are accompanied with physical therapy for stretching and strengthening of the involved area. For a more drastic and aggressive approach, a bursectomy, or removal of the bursa may be required. With proper treatment the patient can expect a full recovery and return to all activites that were being undertaken prior to the onset of the bursitis. This article was written by Eric McGlone, PTA.